The plans were proceeding for the second wave of the airship scheme and orders were being placed for the "30" series ships. The R31 and R32 were of new design and were being completed by Shorts, whilst the new ships registered R33 and R34 were on the drawing boards. In 1916 the new ship was in the process of being designed when a stroke of luck, caused the latest German airship technology to be handed to the British on a plate. On the night of 23rd/24th September 1916, the German Zeppelin L-33 was brought down at Great Wigborough, Essex. The L-33's commander had been participating in an air raid on London when it was damaged by antiaircraft fire, and then intercepted and brought down by a night fighter who's fire failed to ignite the hydrogen. However so much damage was done to the gasbags and fuel tanks that the ship was forced to descend. The German crew attempted to destroy the ship instead of it falling in to enemy hands but so little hydrogen was left that only the doped fabric lit when they fired signal flares in to the hull. The L-33 was virtually intact and her motors were undamaged. In one stroke the British had been handed a near perfect ship full of the latest German technology. Immediately a crew of investigators recorded every feature of the ship in detail. This top-secret record took five months to complete. The designs for the R34 and R34 were put on hold whilst this was being undertaken. It was with this information that the British designers could adapt the plans to include what the Germans had done so successfully, and this enabled the design teams to produce near copy designs for the R 33 and R 34. The R33 was allocated to Armstrong and Whitworth at their Barlow works just some 3 miles south of Selby, Yorkshire. The manufacture of the components for the R33 and her sister ship R34 had begun in the summer of 1917, but the actual construction of the ship in the shed did not commence until the summer of 1918. The ship had a marked resemblance of the L33 although the similarity in numbering was purely coincidental; the R33 has been designated in early 1916 before the crash. The ship design was semi-streamlined fore and aft, with a parallel mid-ships section. The main control car was positioned well forward on the ship, and on closer inspection was separated from the engine in the rear of the car by a small gap. This was designed to stop vibrations from the engine car being transmitted down to the forward control car, with its radio detection finding and wireless instruments. Hence, the forward control car and engine car looks as if it is one combined piece, but serviced by two ladders into the hull above. How the St Nicolas Magazine portrayed the breakaway. Two more power cars were suspended in the wing positions further aft along the hull and a single engine aft car was positioned amidships at the rear of the craft. All five engines were 275 hp, Sunbeam Maori water-cooled petrol units. The power cars were another technical advancement in airship technology, which included two gearboxes for each engine, enabling the engines to be started up and running without the propellers rotating. The ship carried enough fuel for 48 hours engine running, but to increase range it was possible to fly the ship on only 3 engines, giving the ship a speed of some 40 knots with petrol consumption of one mile a gallon. The petrol was held inside the hull and fuel flowed from them by gravity to header tanks in the engine gondolas. The reasoning behind this change of arrangement was to feed a smoother and more precise fuel supply than the older arrangements in earlier ships of direct gravity feed. 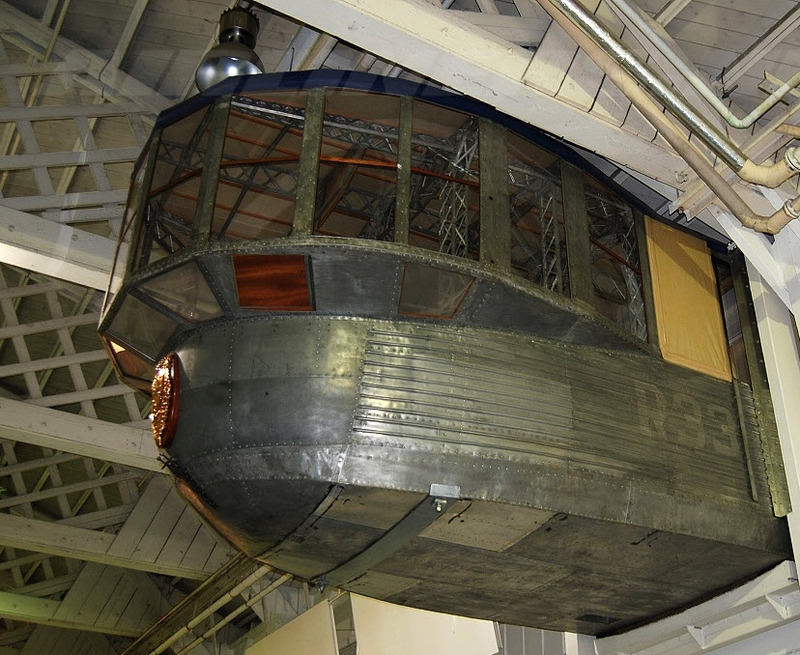 The radiators in the forward engine gondolas had the flow of air regulated by the use of movable shutters, however the rear gondolas had the old type of traditional "elevated" radiator. Twenty main frames and thirteen longitudinals made the main structure of the ship. There were 19 gasbags within the hull giving a capacity of 1,950,000 cubic feet of hydrogen giving a disposable lift of almost 26 tons. The total construction of the R33 came to �350,000 (�9,536,000 today). After almost 9 months in construction, the R 33 was launched on 6th March 1919, just eight days before her sister ship the R 33 was put in to operation, almost immediately. As soon as her test flights were over she was delivered to Pulham Airship Station. The ship had been designated as a long-range rigid scout ship to have operations over the North Sea. During the period from 18th June 1919, to 14th October 1920, the R33 carried out 23 flights totalling a flying time of over 237 hours. 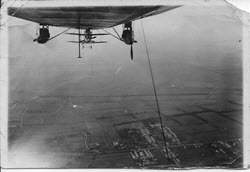 One of her tasks during 1919 was to fly over London and the main cities to publicise the sale of Victory Bonds One flight from Pulham to south Wales and back was recorded in having taken 25 hours. On the 2nd July 1919, when the R34 began her transatlantic flight, the R33 also left the sheds that day with the SR1 to fly over the peace procession in London, again the ship towing a very large banner advertising Victory Bonds. On this flight the ship carried a band on the top gun platform, however the band members would have been out of sight from the crowds below the ship and it is doubtful that the music would have reached the crowds as well. Again in July 1919, the R33 was tasked with carrying out an endurance flight which took her over the main cities of the Midlands and the North of England, flying over Sheffield, Bradford, Manchester, Liverpool, North Wales, the Isle of Man, and the Irish coast. Again on this trip a band was carried and played whilst over the cities from the upper gun platform. The duration of this flight was 31 hours. In September 1919, along with the R32 that had just been completed by Shorts Brothers at their new construction facility at Cardington, the ships took off for a demonstration flight over the Netherlands. As part of the "Britain's Power in the Air" campaign, the R32 and R33 were dispatched to Amsterdam, where the 1919 Aircraft Exhibition was being held. They left on 11th September and crossed the North Sea then dropped a message by parachute to the officer in charge of the Exhibition, then circled Amsterdam for some time. For this flight the ship had been "civilian-ised" as a number of beds had been installed in the two craft and a chef carried to provide a five course dinner, in order to demonstrate that the airship had possibilities for civil aviation. From Amsterdam, the ships then turned south along the coasts of Holland and Belgium, then turned to over-fly Brussels and Antwerp, and then a detour to take in the battlefields of Flanders. They both returned to Pulham after a round trip of some 22 hours, in which a in-flight newspaper was published and copies distributed to the on board pressmen who had enjoyed the flight. 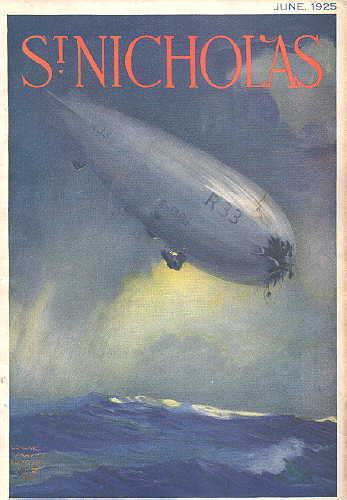 In 1920, following the change in responsibility at the Admiralty to the newly formed Air Council, the RAF airships were registered as "civilian aircraft" to carry out limited programmes in the commercial field. The first to be civilianised was the R33, which for this transitional period was fitted out with sleeping accommodation within the hull and cooking facilities were also provided. The R33 carried the civil identification registration G-FAAG on the hull sides and the large international "G" for Great Britain was emblazoned on her tail fins. In this new livery she arrived at Pulham and began experimental work mainly on mooring techniques. 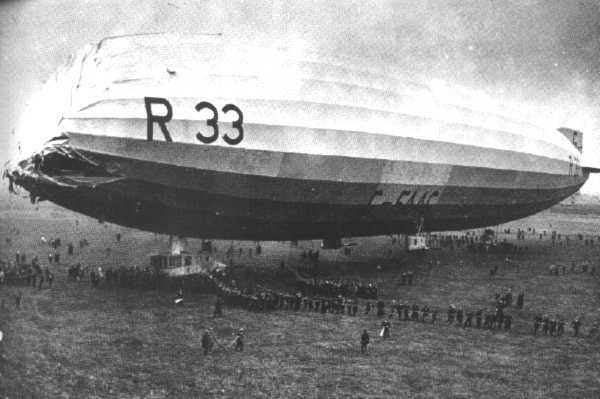 The National Physics Laboratory was still conducting mooring trials on large rigid airships and R33 was asked to participate. A new technique was being developed and that was to moor airships to a mast. A mast had been erected at Pulham and had a revolving docking cone at the top to enable the ship to weathervane around in the wind. Over several months the R33 made some 50 moorings by Captain Williams, and involved some 171 flying hours. The results of these tests were surprising as it was found that not only could a ship be moored into winds of up to 35 mph, but that the craft could be brought up to the mast in very bad weather conditions and moored. One report stated that the ship could be moored in winds gusting at 80mph. Many local residents in the area remembered the ship on her mast and recall the impressive site of the ship riding the mast at night with floodlights shinning on her silvery hull, the lights on board gave her the impression of an ocean liner lying in dock. On her mast the R33 proved that she could handle all weather conditions, but dry snow caused a problem. Captain Thomas devised a snow clearing gear which consisted of an endless wire atop the ship between frames 7 and 34 which dragged lengths of two and a half inch hemp rope fore and aft along the ship's cover. 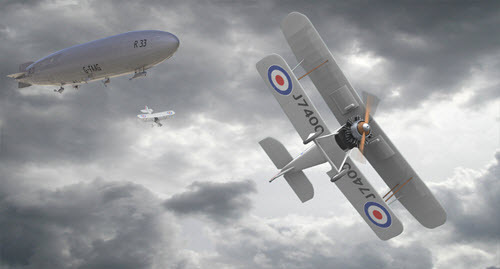 In May 1920, the R33 flew north from Pulham to Howden Air Station to carry out an unusual experiment involving the release of a fighter aircraft from beneath the airship. The fighter was a Sopwith Camel and the pilotless plane was launched from the ship with its engine running, over a deserted area of the North York Moors. After making it's powered descent it crashed, but due to a new type of fuel tank, which was being tested, did not catch fire. On 20th September 1920, due to the worsening post war economy the Air Ministry ordered all work on Airships to cease, but the run down of airship operations took a further 12 months to be implemented. It is noted that this order did not apply to the construction for the R38, which was under construction at Cardington at the time. 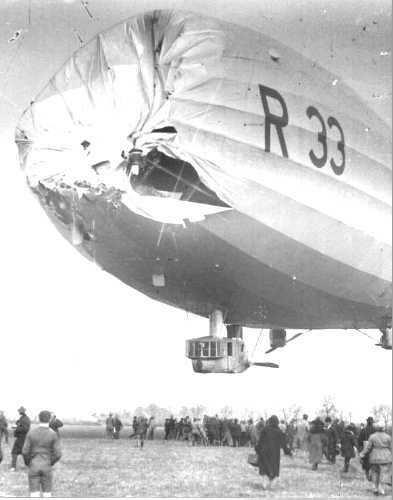 At this time the R33 badly needed an overhaul, but the two newly surrendered Zeppelins, the L-64 and L-71 were occupying the berths at Pulham. It was then decided that the R33 should be flown to Howden which had space for her, and there she stayed until 2nd February 1921. 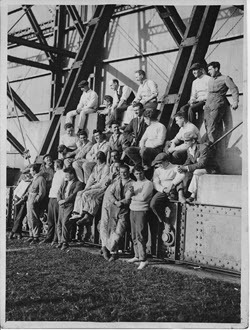 An incident occurred during the spring of 1921, which could have ended in tragedy, but went part of the way to earn the R33 a reputation for being a "lucky" ship. A rigger was engaged on a task high up in the envelope of the ship, but managed to lose his footing and slipped and fell. In his decent he ripped open one of the gasbags in the stern, the bottom girders of the hull arresting his fall. The rigger was not hurt and only slightly affected by the escaping hydrogen. The sudden loss of gas meant that the stern began to drop, and a ton of water was dropped to bring the ship to an even keel, and the ship returned slowly to the Pulham base. On 17th March 1921, a few days after the rigger accident, and repairs had been made to the ship when a rudder jammed whilst the ship was carrying out tests over Essex. The ship was forced to circle for over an hour above the Thames Estuary, whilst riggers struggled to free the rudder. At this time, the economy was falling deeper into depression, and on the 28th June, the Government declared that all airship operations were to be run down and ceased. The R33, R36, R37, and R80 along with the remaining German Zeppelin, L71 were to be given for sale to any operator who could fulfil the Governments requirements. The offers were open until 1st August 1921 and if no offer was made then the craft were not to be scrapped but to be placed in store. During this time, further tasks were still being allocated to the ship, for example after dark flights over South London and Surrey to view from the air the new airport lighting system at Croydon Airport. The ship was also involved in helping with traffic control by assisting with the police during the Epsom and Ascot race weeks. To avoid the ship having to return to Pulham, the ship was moored to a wooden mast at Croydon Airport on the nights of 14th and 15th July 1921. Having worked almost full time, on the 21st July, the R33 made a dramatic entrance at the Hendon Air Show, Royal Air Force Pageant. The ship lurked out of view behind a phosphorus cloud laid by a Hadley Page Bomber, where upon at the appropriate time, the ship burst through the cloud to the admiration of the crowds below. On the 30th July some full speed trials were carried out, and a speed attained of 52 knots. After this she flew to Cardington on 18th August and was shedded there. 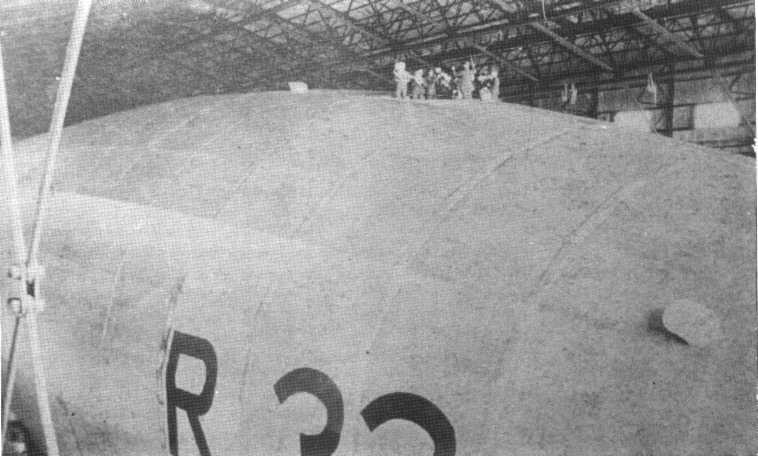 The R33 was then deflated and lowered on to her cradle and stored. This would be the resting home of the R33 for the next three years. It wasn't until the economy turned, the Imperial Airship Scheme was decided and it was agreed that the R33 would form part of that programme. 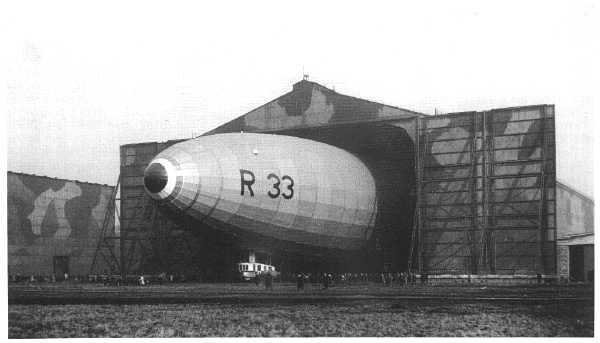 On 2nd April 1925 the Cardington shed doors opened and the new reconditioned R33 emerged. For more than four years she had laid in the berth which had been previously occupied by the ill-fated R38. The changes to her livery were that the RAF roundels, the red white and blue tail stripes had also been removed, and only her civil registration G-FAAG was painted on her hull. During her reconditioning, new modified gas cells had been incorporated within her and her motors had been modified. 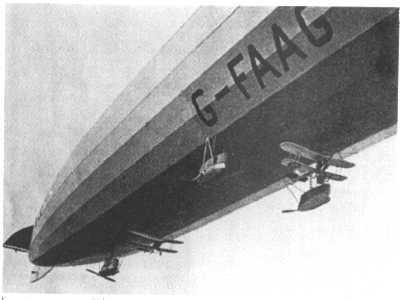 She was put on the newly erected Cardington Mast to have a shakedown of her new equipment. 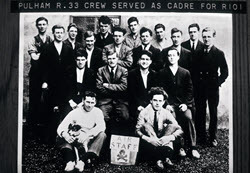 The ship left Cardington under the command of Flight Lieutenant Carmichael Irwin, with a crew of 34 and flew to Pulham. The journey took 4 hours and 45 minutes, and was deemed a success for the newly conditioned ship. The R33 was then put back on to her old regime of testing for the National Physics Laboratory. Laminal flow tests were carried out and results were sent to the technicians who were in the process of designing the R100 and R101. Two weeks after her arrival, on the night of 16th/17th April, the wind had increased to gale force, and towards dawn the wind was gusting up to some 50mph. The R33 was moored to the high mast, and weathervaned in the wind. Only an "anchor watch" was onboard, and in one particularly strong gust, the R33 was torn from the mast. The ship drifted away from the mast and water streamed from her bow from the ballast tanks that had been damaged. The ship, flying backwards, narrowly missed the doors of airship shed. The number 1 gasbag had of course been punctured and there was a danger of the fractured light alloy girders deflating the no.2 bag. The force of the ship tearing away from the mast caused the nose to buckle inwards, causing a hollow in which the wind and rain battered, pushing the bow down still further. The ship began to gain height as the crew slowly started up the Maori engines on watch. In order to keep the forward damaged girders from puncturing more of the gasbags, Flight Lieutenant Booth and Coxswain; G "Sky" Hunt has to assess the damage. They crawled up the ladder to the upper gun position, and then crawled forward as far as they could along the top of the hull. 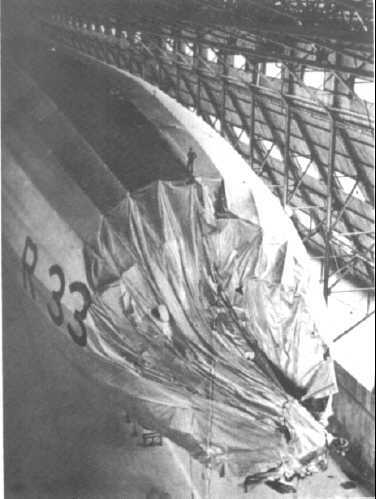 It was found possible to prevent further damage by rigging the deflated gas cell, and the flapping envelope, as a shield. As much equipment as possible was jettisoned from the forward section to bring the ship on to an even keel. As soon as the plight of the R33 was noticed, attempts were made to calculate the ship's drift and urgent wireless messages were sent to the appropriate authorities. HMS Godetia was ordered to make ready for sea in great haste and was dispatched from Lowestoft to render assistance in case the R33 floundered in the North Sea. The local lifeboat was also called out, but nearly swamped in trying to keep in view of the ship. The weather worsened and the lifeboat had to turn back as the airship was last seen heading in to a rainsquall. With her engines running, the R33 was able to keep her head in the wind but not able to make headway against the gale. Radio messages were transmitted every 15 minutes to report on the ship's condition and her position. After 5 hours since the ship broke away from her mast, the crew were able to arrest the ships drift, but the wind was still forcing her nearer the Continent. At 3.45pm she was 45 miles north east of the Dutch port of Ymuiden. At one stage the ship came perilously close to the sea and flight Lieutenant Booth gave orders that everything possible including all surplus was to be thrown overboard, which included the hammocks, fire extinguishers and parachutes. Finally the rain stopped and the descent of the R33 was checked. A window in the weather allowed the R33 to begin to make a slow passage home. The ship was very close to the Dutch coast, and orders were being given that the ship should land at Cologne where a German crew was ready to assist. However later in the evening the ship came to a hover over the Dutch coast, and she stayed there until 5.00am the next morning. After thanking the various authorities for their help, the ship began the slow journey west, back home. Eight hours later the damaged ship made her way over the Suffolk Coast, to crowds of well-wishers who had lined the shore awaiting her return. At 1.50pm, the R33 appeared over Pulham and, as expected, there was no shortage of volunteers to man the trail ropes. The ship was eased down to the ground and then slowly walked into the shed where she was berthed next to the R36. King George V later presented the crew with watches and the coxswain, Sergeant "Sky" Hunt, was awarded the Air Force Medal, which he insisted be awarded on behalf of the crew as a whole. 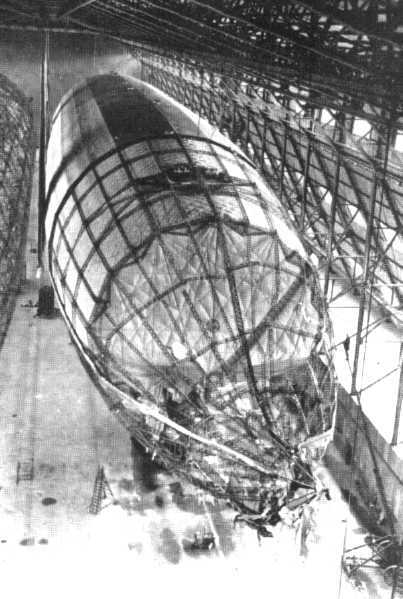 A new nose section was designed by the drawing office staff at the Royal Airship Works at Cardington and was constructed at Pulham and spliced into the hull in place of the original during October 1925. The new nose was specially strengthened for mooring experimental work. The R33 came out of her shed following the repairs on 5th October 1925 where she had been since April. 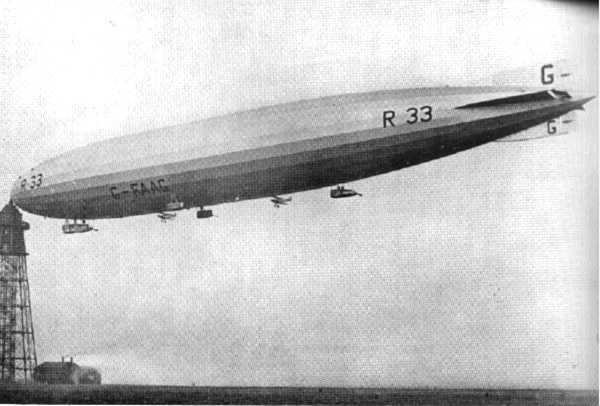 She was to carry out pressure experiments in connection with the design of the new R101. These experiments involved taking readings of the pressures exerted on the girders and envelope during flight. Ten days later the ship took part in a series of experiments involving the launching of an aeroplane from the ship. The reasoning had been to provide protection of the ship from fighter aircraft. Original experiments had taken place on the R29. The R33 was fitted out with a large trapeze in the middle of the hull, to which a small two? winged monoplane was hooked. The tiny D H 53 Hummingbird had been modified with a gantry above the forward part of the plane. The first trial was carried out on the 15th October 1925. The R 33 rose to 3,000 ft. At that altitude, a signal was given and the pilot pulled the release lever. The mechanism worked perfectly and the Humming Bird dropped away from under the ship and started it's motor whilst in a gentle dive. The pilot then flew around the R33 and then brought the plane back up to the trapeze matching the speed of the airship. At the critical moment while linking back with the ship, there was a small hitch and later there was some doubt as to whether the signal to "re-engage" had been given. As the plane came in to engage it knocked into one of the trapeze stay wires and the propeller was smashed. The pilot then disengaged the suspension gear and dropped down to glide to the airfield below. 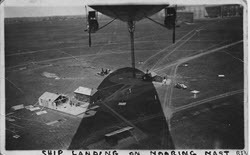 This experiment had noted that the approach of the pilot was incorrect and that the trapeze should have only been lowered when the plane was approaching from the stern. Then there would have been a perfect approach whereby the nose gear would have easily slotted in to place.A second attempt was made on 28th October 1925, and again the monoplane snagged on the trapeze, however the pilot was able to land on the airfield below. On 4th December the attempt was made again, and this time the plane disengaged and re-engaged successfully to the ship. This was the last flight of the R33 for some months as she returned to the shed for deflation and an overhaul. In the spring of 1926 the Government announced that the experimental programme using the R33 had come to an end and the ship was to be shedded at Pulham. Both the ship and the station were set to a care and maintenance programme. However it was not long before the station was open for business again and the R33 was re-launched to take part in further experiments involving the launching of fighter aircraft and for trials at the newly erected mast at Cardington. Instead of the little "Humming Bird", the R33 was equipped with two of the RAF's most powerful fighters, Gloucester Grebes. The idea being that the craft would not only be used for defence but also to provide ship- to- shore communications in the same way that a warship uses its boats. The Gloucester Grebe had a loaded weight of just over one ton. One of the craft was placed amidships and the other one aft of it, both on retractable trapezes. The ship took off from Pulham on 21st October 1926 under the overall command of Major Scott, and Squadron Leader Booth acting as Captain. When the ship reached 2,000 ft the rear mounted Grebe released and cleared the ship, the second Grebe followed suit and both planes flew around the "mother ship" and returned to base. 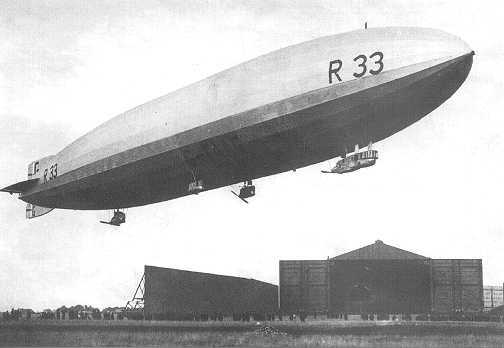 The R33 terminated her flight at Cardington. Two more Grebes were flown from the ship when the R33 flew from Cardington to Pulham on the 23rd November. One of the last tasks for the R33 was to try out several design structures in connection with the layout of the new ships. The R33 was put in to the Pulham shed in November 1926 for long term storage. 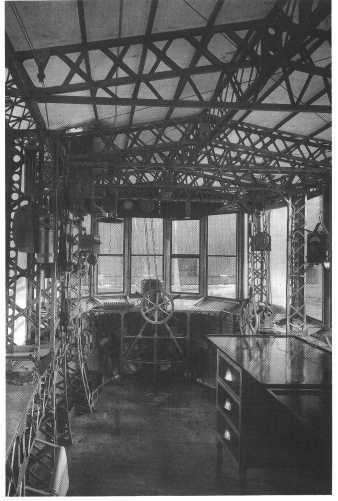 She languished there and after metal fatigue was detected in the framework; she was forced to be dismantled during 1928. 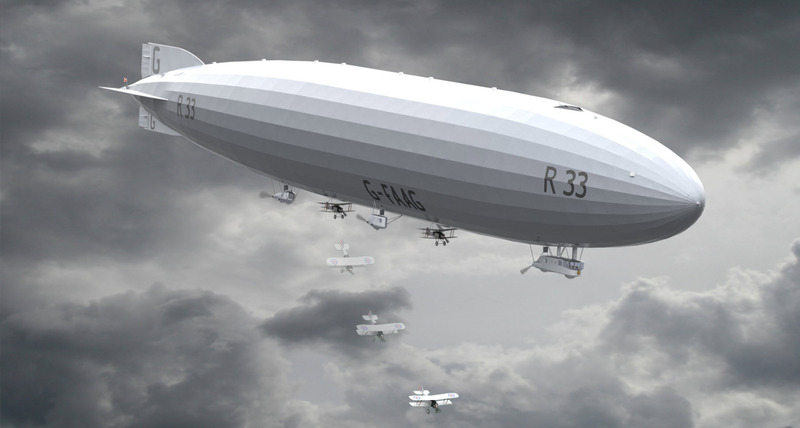 During her 10 years life the R33 survived being struck by lightning, as well as being set adrift over the North Sea but provided essential data for the larger ships, the R100 and R101, and also proved that the aeroplane and airship could work together. This of course, was later both used by the German and American rigid airships. 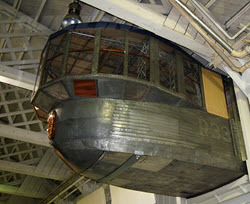 The forward part of the control car of the R33 can be seen at the RAF Museum in Hendon in the upper gallery.